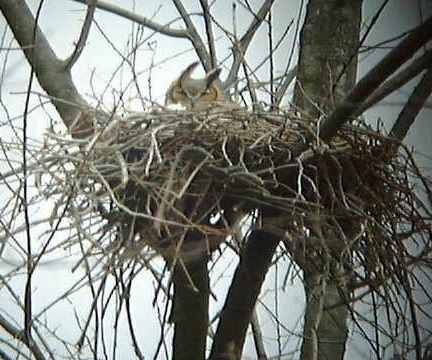 Great Horned Owl on nest - Who is watching Whom? Welcome to my birding page. I compile the Central Pennsylvania Birdline and there is a link to the most recent birdline below. This link has a few pictures and description of an Eared Grebe seen at Centre Furnace Pond outside of State College, Pennsylvania on 30 January 1999. This link contains a few pictures of a female Clay-colored Sparrow, one of a mated pair, that was present at Piney Tract in Clarion County on 5 June 1999. The following link contains photos and description of a Ross's Goose seen at Luxor Pond in Westmoreland County on 10/20/1999 and 10/21/1999. The following link provides pictures of a pair of fourth-year Bald Eagles seen at Beaver Run Reservoir, Westmoreland County, PA on 15 January 2000. Two Greater White Fronted Geese seen along the Indiana County and Westmoreland County border on 1 March 2004. The following is a page of links to other interesting birding sites. Counting since 2 March 2004.